The 'Quebec' and 'Surveillante' in Action, 6 October 1779, Robert Dodd, 1781, National Maritime Museum. In the early days of this blog, I touched very briefly on the action between the frigates Quebec and Surveillante. Due to an unfortunate accident while pursuing a French convoy, Royal Navy Captain George Farmer lost the twelve pounder guns from his 32 gun frigate Quebec, and replaced them with nine pounders. This loss would prove devastating, when the Quebec found itself pitted against the 36 gun Surveillante. The ten gun cutter Rambler (which you can see veering away in the right of the painting) would have provided some assistance, but was ensnared in her own duel with a French cutter of similar armament. A three hour duel ensued, and for a brief moment the tide of battle shifted. The Surveillante lost all three of her masts, effectively crippling the ship. Just as Farmer was moving the Quebec to take advantage, all three of her masts also went over. Still the battle continued, with an attempted boarding by the French being repulsed. Shortly thereafter, a fire began on the Quebec that would prove her doom. 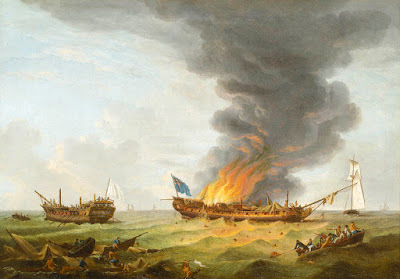 Farmer knew full well the dangers of a fire on a heavily armed warship, and tried to flood the magazine, but too late. The image above depicts the explosion that destroyed the Quebec. Only 68 men of her nearly 200 survived. You can find a more detailed account of the action over at the Age of Sail blog. Surveillante's boats were all destroyed in the action, so the French could do almost nothing to save their enemies. There was at least one boat from the Quebec that managed to survive, and that is what Dodd depicts here. Streaming from the water to the boat are shirtless men who try to swim to refuge. The men aboard the boat are both in shirtsleeves and jackets. There are green, blue, and red jackets scattered through the men. Black round hats are visible on some, and a red cap on another. Blue breeches can be seen on the oarsmen closest to the bow. Clinging to the lost sails and mast (presumably of the Quebec) more sailors try to signal to the boat for assistance. 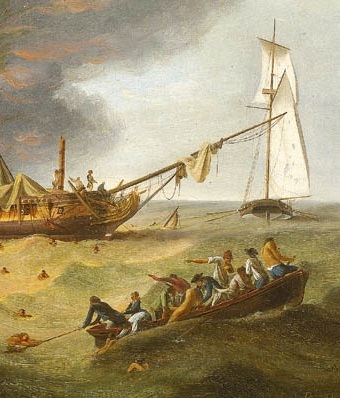 Several are naked, with one shirtless man straddling the lost mast in his blue breeches. A number of blue jackets are seen on men grasping the yards and fighting top, with one jack wearing a pair of petticoat breeches. Interestingly, he does not wear stockings. It may well be that he stripped them free to allow for easier swimming, but this is mere speculation on my part.